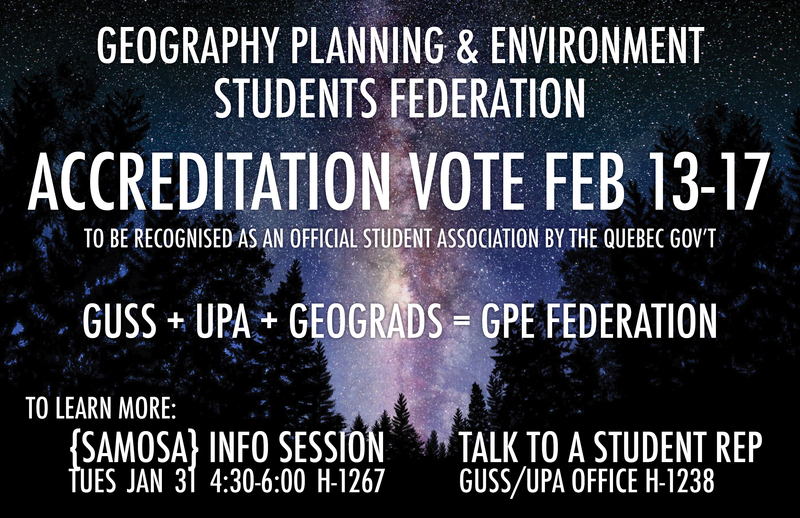 Over the last few years Geograds, along with the undergraduate student associations of the department for geography (GUSS) and urban studies (UPA), have been seeking to become an officially accredited student association as the GPE Federation, representing all students of the Department of Geography, Planning and Environment at Concordia. The next step is a referendum-style ballot vote. It will take place the week of February 13-17 (the week before Reading Week). All GPE students (undergraduate and graduate) are eligible to vote. For more information about what the accreditation is and what effects it might have, the GPE federation will be hosting an information session on Tues Jan 31 from 4:30-6:00 in H-1267. The facebook event can be found here. Hey folks! I’m going to be running the GPE Federation accreditation drive, so I just wanted to get some FAQs out of the way. First though, you may know me already – I graduated last year but I was a UPA exec and then an ASFA exec, and then a CSU employee. I’m doing this because accreditation is something I worked on when I was at the UPA and it’s nice to see it come full circle. Accreditation, in short, means that a student association gets formally and legally recognized by the provincial government, which comes with a few perks. The application has been submitted to the provincial government and now the next step is for you guys to vote on it to make it clear that the members support it. The polling period is from ****Feb 13-17**** and we’ll be coming to classes with the ballot box during that week. You’ll also be able to vote online through the MyConcordia portal, more on that to come. The reason all this began is because the school tried to take away our office space in the TD building and give us the closet you probably know now on the 12th floor. We pushed back and somehow ended up with both, but since accredited associations are legally guaranteed office space, we started pursuing it just in case they try it again. For the exact legal text with more info, follow the link below or check out the versions posted in French and English next to the UPA/GUSS office window and/or on the window of the GIS lab. 3. What’s this GPE Federation? The first step to accreditation is to incorporate. Because the accreditation law states that only one group per department can be accredited, we had to create a federation of the three departmental student associations – GUSS, UPA and GEOGRADS. This federation became incorporated a few years ago (under the name Geography, Planning and Environment Graduate and Undergraduate Federation), so surprise! You’ve been part of a corporation all this time! Just try not to be an evil corporation. If you are registered for a major, minor, specialization, honours, MEnv, DEA, MSc, PhD, etc. in Geography, Urban Planning/Studies, Human Environment, uh…Geology? You are a member and can vote! 5. Why should I care? Admittedly this is probably not going to impact your lives in any dramatic sort of way in the near future. I would say consider this as a sort of insurance for the future of the department’s student representation. So now that you’ve read through this whole thing, I have to assume you’re interested. You should volunteer to help spread the word, do classroom visits, and/or count ballots! If you want to help out, please message me or sign up on the sheet in the UPA/GUSS office. TL;DR There’s an important vote coming up regarding whether we should become legally recognized by the government.